Each year about 63 million tons of food is wasted annually in the U.S., according to the non-profit ReFED in a report released this week. The restaurant industry alone generates about 11.4 million tons of food waste annually at a cost of about $25 billion per year. But for every dollar invested in food-waste reduction, restaurants can realize about $8 in cost savings, the San Francisco-based ReFED said in a new guide for reducing food waste. 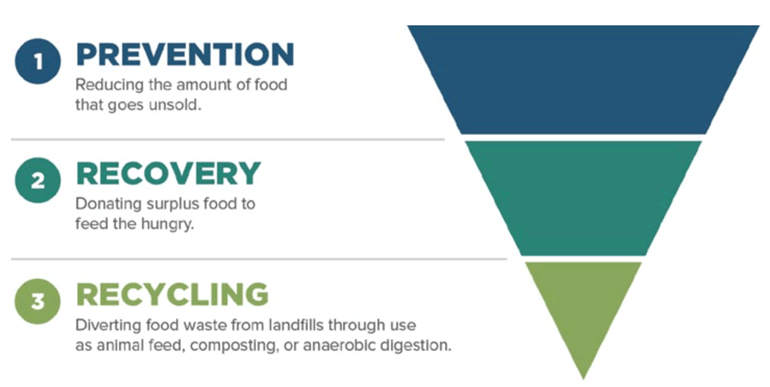 Last year, ReFED released the report “Rethinking Food Waste through Economics and Data: A Roadmap to Reduce Food Waste,” with a comprehensive plan for action. The research concluded that food waste is a solveable problem, but it needs big picture solutions, including significant funding, support from policy makers, innovation and education to change behavior. The new guide, however, is based on that report and offers specific action for restaurant operators to do their part. Preventing waste in restaurants could save nearly $620 million annually, and tracking food that is thrown away could cut food costs by 2 percent to 6 percent, the guide said. Design menus to reduce the number of ingredients and repurpose food prep trim and overproduction. At Haven’s Kitchen in New York, for example, leftover kitchen trim like lemon peels and kale stems are used for cocktails and a dedicated space in the walk-in was created for bar service. Offer consumers multiple portion choices and encourage them to order only what they want. Use smaller plates in self-service and all-you-can-eat service settings. Cornell University research on food psychology found that consumers given larger bowls took 16 percent more cereal than those with smaller bowls. Consumers generally find a 70-percent fill rate to be visually pleasing. Eliminate the use of trays in self-service settings. If guests are required to balance plates, they will be discouraged from returning for refills. The University of Massachusetts Amherst dining hall removed trays from all dining halls in 2009 and reduced post-consumer food waste by 30 percent. Use “imperfect” produce. Bon Appetit Management Company, for example, in 2014 launched the Imperfectly Delicious Produce program to use “ugly food,” or produce that was blemished, misshapen or visually imperfect. The company worked directly with farmers and distributors to source imperfects and worked with chefs to incorporate them into menu offerings. The move helped maximize cost savings and enhanced the brand with customers, the report said. Remember: What’s measured gets managed. Track wasteful practices and use the data collected to make operational changes. While it may require an upfront investment, this step can have a significant bottom-line impact, the report said. Aramark, for example, uses LeanPath’s tracking and analytic platform in 500 of its largest accounts. Since rolling the software out in 2016, the foodservice contractor has reduced food waste by 44 percent on average across 161 sites, diverting about 479 tons of food from ending up in landfills. But tracking food waste can be as simple as observing, weighing and recording waste content in bins, counting loads hauled, or using a smart scale linked to a tablet. Make purchase decisions based on historic sales and surplus food data and inventory logs. Negotiate with suppliers for deals the best suit your operation’s customer volume, and create feedback mechanisms that allow chefs to adjust supply specifications. ReFED estimates that food recovery networks in the U.S. receive and distribute about 1.7 million tons of rescued food each year. But the organization said more than three times that amount, or up to 5.8 million more tons, could be recovered. 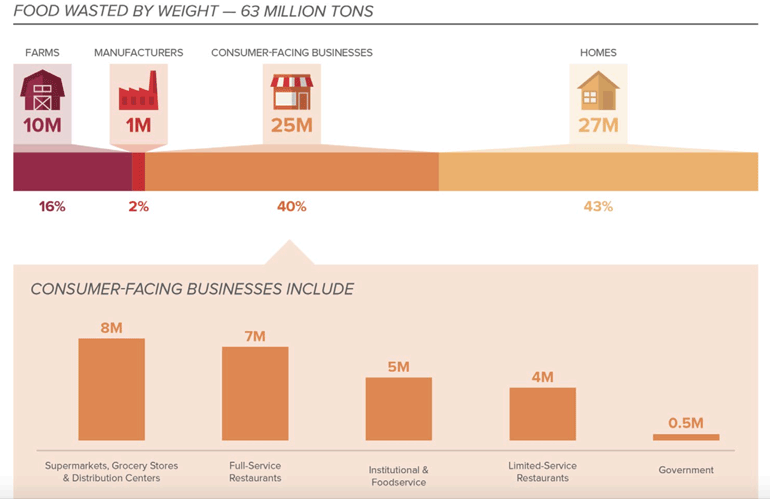 Only 10 percent of surplus food is being recovered in the foodservice and restaurant sector, leaving about 1.5 billion meals per year uneaten. ReFED recommended tax incentives and standardized donation regulations to encourage this practice, along with education about liability laws. Restaurants, meanwhile, can use donation matching software to connect with recipient organizations for smaller-scale donations. Donations under 50 pounds are expensive for food recovery organizations to pick up, and some set a minimum amount for donation. But a growing number of technology solutions can help agencies identify multiple small pickups and more efficient routes, for example. Growing matching software platforms include Spoiler Alert, Zero Percent, Copia, Community Plates and Food Cowboy, the report said. This is the most scalable path to reducing food waste nationally, according to ReFED. About 500 composting facilities across the country accept food scraps. Deliver waste by truck or through existing sink disposal pipes to a municipal water resource recovery facility where it is treated with anaerobic digestion, and biosolids are used for compost. Use an in-vessel composting machine, use a commercial greywater aerobic digester that breaks down food organics so they can be flushed into the sewage system, or send waste to a centralized facility for composting. The Intercontinental Miami, for example, uses an Orca commercial greywater system and has reduced its monthly waste bill by $2,600 per month, the report said. Feed food waste to animals after it is heat treated and dehydrated, and either directly or in dry feed. Recycle cooking oil. There’s a market for used fats, oils and greases that can generate income or result in reduced-fee oil supply arrangements.